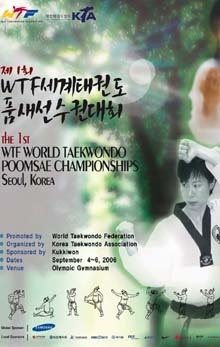 Preparations for the 1st WTF World Taekwondo Poomsae Championships scheduled for Sept. 4-6, 2006 in Seoul, Korea are going smoothly, organizers said yesterday. "As of Aug. 17, a total of 47 countries confirmed their attendance in the inaugural World Taekwondo Poomsae Championships," said Jin-bang Yang, deputy secretary general of the Korea Taekwondo Association. Yang predicted that about 700 athletes and officials from more than 55 countries are expected to participate in the event, which will take place at the Olympic Gymnasium No. 2 at Olympic Park. "The sheer number of participating countries reflects the growing interest in the inaugural World Taekwondo Poomsae Championships by WTF member national associations," Yang said. Among the countries that are expected to attend the Seoul championships are Sweden, Great Britain, Serbia & Montenegro, Jordan, Germany, Ukraine, Norway, Japan, Russia, Iran and Pakistan. The opening ceremony of the championships will take place at the competition venue at 10:30 a.m. on Sept. 4. The closing ceremony is scheduled at noon on Sept. 6. During the opening ceremony, the WTF will celebrate the newly designated Taekwondo Day, together with the KTA, the Kukkiwon and the Taekwondo Promotion Foundation. The WTF designated Sept. 4 as Taekwondo Day at its General Assembly in Ho Chi Minh City, Vietnam, last month. On Sept. 4, 1994, the International Olympic Committee decided to accept taekwondo into the official program of the 2000 Sydney Olympic Games. To mark the 1st Taekwondo Day, WTF President Chungwon Choue, together with high-ranking officials of the KTA, the Kukkiwon, the Taekwondo Promotion Foundation, is scheduled to host a reception, in the form of a welcoming party, for the visiting heads of delegations of the World Taekwondo Poomsae Championships and other dignitaries from at home and abroad at 6:30 p.m. on Sept. 4, at the Olympic Parktel. The KTA is also organizing the 2nd Korea Open International Taekwondo Championships. The annual Korea Open is scheduled to kick off in the afternoon of Sept. 6 for a four-day run at the same Olympic Gymnasium No. 2, with its opening ceremony scheduled to take place at the same venue at 5 p.m. on Sept. 7. "As of yesterday, 26 countries notified us of their participation in the Korea Open, and we expect that number will rise to more than 33," Yang said.